Create pricing DID batch for reseller. Assign the pricing DID batch to the reseller. Create a pricing DID batch for a customer. Assign the pricing DID batch to the customer. 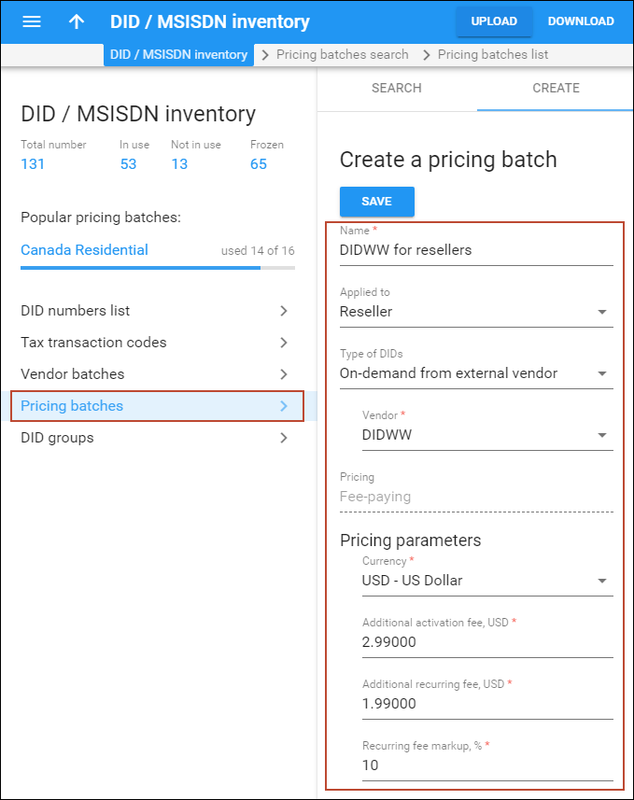 This chapter demonstrates how to configure a DID World Wide supplier vendor and set pricing parameters for DID usage. This will allow your reseller’s customer to pick a number belonging to the desired country / city from the inventory of DID or toll-free numbers available on the DID vendor side and then assign the number to one of his phone lines. The checklist below assumes that you have already configured the basic SIP services according to the instructions provided in the previous chapters. Assign DID as an alias for this customer’s account. Program the parameters (phone number, password and SIP server address) into the SIP phone and make a test call. The pricing DID batches are sets of pricing parameters to be applied to different customer groups for DID usage (e.g. you may want to charge your resellers differently from your retail customers for DID usage). · Applied to – Specify Reseller. 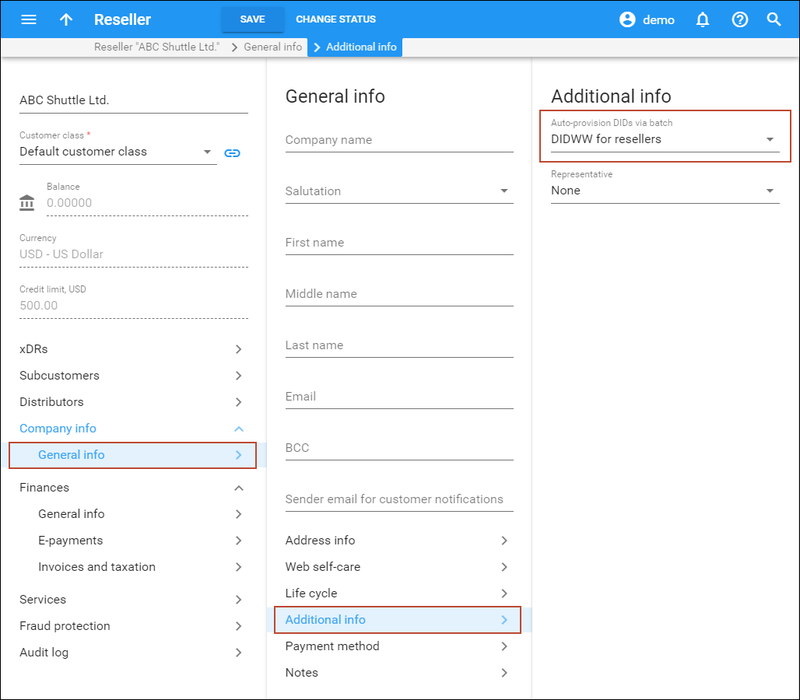 · Type of DIDs – Select the Add On-demand from external vendor option. · Vendor – Select the vendor providing DID numbers for this batch. · Currency – Select the currency in which you will charge for DID usage. Note that this batch can be assigned only to resellers who use the same currency. · Additional activation fee – Specify a configurable fixed amount that is charged at allocation of a new number in addition to the DID provider’s activation fee. · Additional recurring fee – Specify a configurable fixed amount that is always included in the recurring (monthly) charge. · Recurring fee markup – Specify a configurable increase of the DID cost (charged by the DID provider) included in the recurring charge in addition to the actual DID cost. · Decimal places, number – Specify the rounding pattern in order to obtain “marketable” figures. This will specify the last “pre-set” digits in the figure. 1. On the navigation menu to the left select Sales, Sales agents and then Resellers. 2. On the Reseller panel, select General info. 3. On the General info panel, select Additional info. 4. On the Additional info panel, select the pricing batch that you have previously selected (e.g. Reseller). To charge your customers for DID number usage it is necessary to create the corresponding pricing DID batch. 1. In the Networking section of the admin interface, choose DID Inventory. 2. On the DID Inventory page, choose DID Pricing. 3. Click Add to add a new batch. 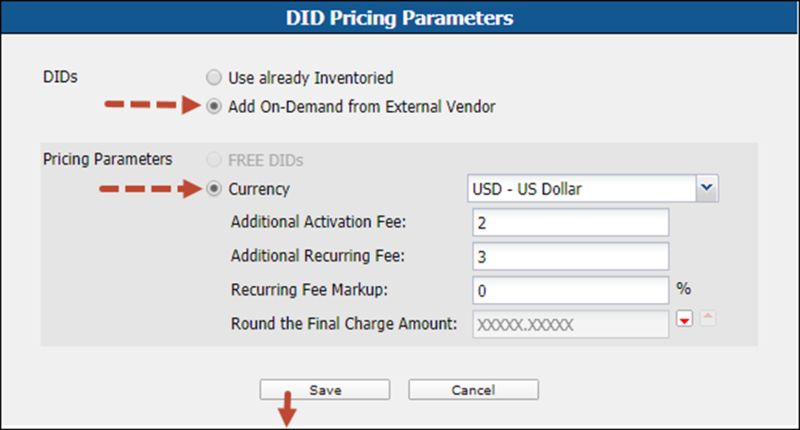 o DIDs – Select the Add On-Demand from External Vendor option. o Currency – Select the currency in which you will charge for DID usage. Note that this batch can be assigned only to resellers who use the same currency. o Additional Activation Fee – Specify a configurable fixed amount that is charged at allocation of a new number in addition to the DID provider’s activation fee. o Additional Recurring Fee – Specify a configurable fixed amount that is always included in the recurring (monthly) charge. o Round the Final Charge Amount – Specify the rounding pattern in order to obtain “marketable” figures. This will specify the last “pre-set” digits in the figure. Click the Save button in the toolbar, or the Save icon on the left end of the row. A customer will be able to browse the complete inventory of DID or toll-free numbers available on the DID vendor side, online. When he picks a number, the sign-up process on the PortaSwitch® side will reserve and allocate that number on the DID provider side and provision it inside of PortaSwitch® (e.g. as an alias to an existing account). When the customer decides that he no longer needs the number (or changes the number to something else), the reverse procedure will happen – the number will be released on the DID provider side and the account/alias will be removed in PortaBilling®. 1. On the customer’s Additional Info tab select a previously created pricing DID batch in the Auto-provision DIDs via Batch list. Click Save. Once you assigned a batch for DID auto-provisioning, DID numbers can be provisioned on the DID provider side for this customer. This is usually done by a customer himself. Please consult the DIDs (External Numbers) section of the PortaBilling® Help guide for more information about allocating DIDs.